A comedian set to perform at the University of Utah this week is facing heavy backlash online — including accusations of religious bigotry and calls for the school to cancel his show — after he promoted his act on Twitter with a photo of himself wearing Mormon temple garments. 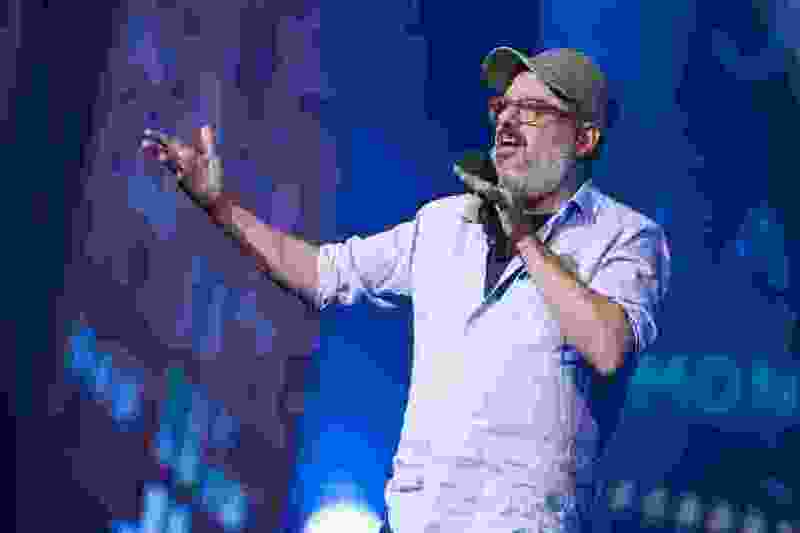 David Cross posted the ad on social media Saturday afternoon with a link to buy tickets and the catchphrase “Utah! Learn the real truth!” He’s pictured standing outside of a dressing room in the sacred underclothes that devout members of the Utah-based faith wear daily. The photo is an altered still from Cross’ sitcom “Arrested Development” in which his character’s red underwear in the scene is replaced by the white two-piece garments. The U. quickly replied to the post with a GIF that made light of Cross’ tweet. It then deleted the response and apologized. Still, some commenters defended the event as an exercise of free speech. A few pointed out that, despite pushback from counterprotesters, the U. allowed conservative commentator Ben Shapiro to speak on campus in September. “We acknowledge the free speech rights of individuals and entities who rent university facilities — even those with whom we disagree. By doing so we protect the free speech rights of all,” U. President Ruth Watkins responded in a statement Sunday. In this case, the U. is renting its facility for Cross’ show, which is being produced by an outside promoter. A spokesman for The Church of Jesus Christ of Latter-day Saints declined to comment. Debra Jenson, a Utah State University professor who has studied pop culture and served on the board of Ordain Women, an activist group whose members want to open the Latter-day Saint priesthood to both genders, said she saw Cross’ post when she got home from church Sunday and gasped. Jenson said Cross is known for pushing the lines on race and gender, but “this just hits closer to home for Mormons.” The picture of him wearing garments, she added, is comparable to someone pulling a hijab, or headscarf, off a faithful Muslim woman. Despite the outrage, Cross seemed to double down on his message. He tweeted later Sunday: “Holy ‘moly’! My opening 10 minutes are going to be on fire!!! Read the replies for some underwear fun.” He also directly responded to criticism from The Atlantic’s McKay Coppins, who is a member of the faith, by mocking him. “I would be more offended by this if it weren't so excruciatingly lame,” Coppins wrote. The comedian’s publicist did not immediately return a request for comment. Cross, who is known for his bombastic brand of satire and commentary, said in an interview with The Salt Lake Tribune this week that he specifically wanted his “Oh Come On” tour to stop in Salt Lake City. “I’ve always had good shows there. Always. It’s a fun place with good, memorable fans,” he said. “I know I’m probably projecting a little bit, but there might be truth to it. I think they are very appreciative, that I come to them — I go to Salt Lake City, I make my way there — and I do the material that I do. And they’re happy to hear it. He’s performed in Utah several times, including a previous stop at Kingsbury Hall in May 2016.